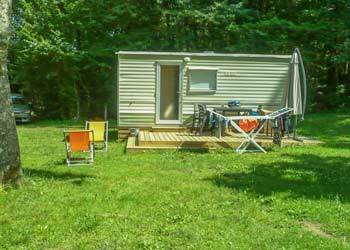 In our campsite in Dordogne, all our mobile homes are well-equipped, comfortable and bright. With the exception of our little Tilleul mobile homes, they are all equipped with a nice bathroom with hair dryer, separated toilets and a wooden, half-covered terrace equipped with a table, garden chairs and deck chairs. Every mobile home is located on a large pitch where you’ll be able to install an extra little 2 person tent if you wish. You can park your car right beside your mobile home. Mobile homes are separated by flowered hedges. At Domaine de Corneuil, you’ll appreciate the quality and cleanliness of our rentals. Are you looking for the comfort of a recent well maintained mobile home? Our range of O’Hara mobile homes : Capucine, Verveine and Pivoine will meet all your requirements. They can welcome from 1 to 6 vacationers. 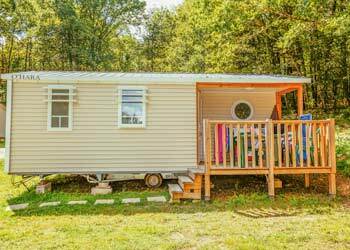 Everyone can choose their kind of mobile home in Périgord : for a romantic getaway, the Capucine mobile home with its cozy semi covered terrace will please you. For a family stay with 1 or 2 children, the Verveine (2 bedrooms) or Pivoine (3 bedrooms) mobile homes will meet all your requirements. You travel with an extended family, the Pivoine mobile home (3 bedrooms and 6 people occupancy) is the perfect option for you. 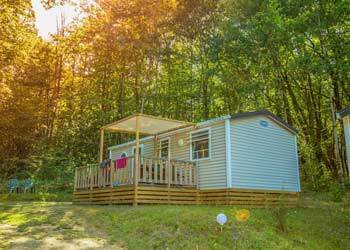 Finally if you are a family with young children and you are looking for a compromise between comfort and traditional camping, the Tilleul mobile homes could be just for you. 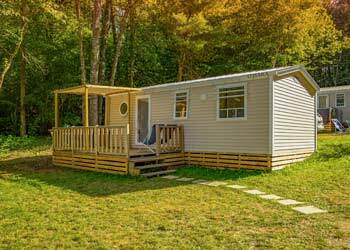 These mobile homes are rentable from 2 nights. These vintage mobile homes are well equipped but don’t have neither a bathroom nor toilets. These can be found nearby in the sanitary unit. The Tilleul mobile home with their cocooning feel will please your young children. They are located on large pitches and are well equipped with a large terrace with deck chairs and a gas barbecue. You can park your car right beside your mobile home. You’ll be able to rent a baby bed, a baby chair, a gas barbecue or disposable bed sheets for all our rentals. At Domaine de Corneuil, there is something for everyone to enjoy! non elementum elit. dolor vel, risus.